Is EUR/GBP Headed to 88 Cents? Is EUR/GBP to 88 Cents? EUR/GBP is headed much higher. On a fundamental basis, Eurozone data has consistently surprised to the upside thanks in large part to the positive effects of a weaker euro. On Monday, we learned that stronger exports drove trade and current account activity higher and in the coming weeks we expect further improvements in the manufacturing sector. Sterling on the hand faces serious Brexit risks. This morning in a SKY interview PM May stated that UK could not expect to hold on to “bits” of its membership after leaving the EU, seeming to stress the “hard Brexit” line that UK would not compromise on the immigrant issue in return for access to the single market. Meanwhile Scotland’s First Minister Nicola Sturgeon warned the Prime Minister that she was not “bluffing” over the prospect of a second Scottish independence referendum, Scotland voted to stay in the EU and the idea of a “hard Brexit” is clearly unappealing to Ms. Sturgeon’s constituents. The best case scenario for the U.K. economy and sterling would be if the U.K. remains within the single market that allows for tariff free movement of goods, services, money and people within the EU but this scenario is appearing increasingly less likely. 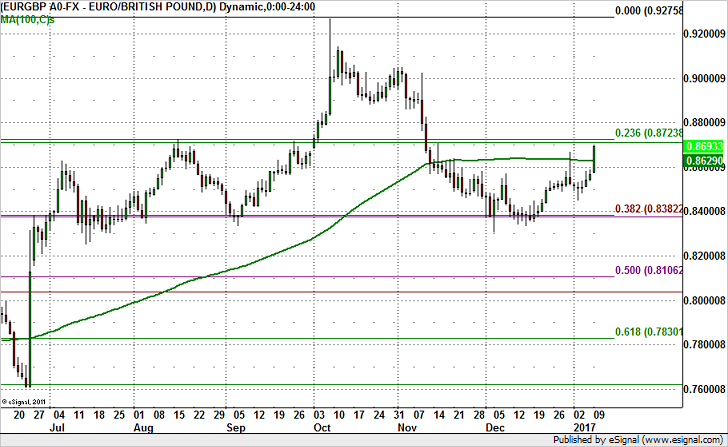 Technically, EUR/GBP has broken above its 100-day SMA but there’s quite a bit of resistance right above current levels. This includes the August high near 0.8725, the 61.8% Fibonacci retracement 2008 to 2015 decline and the 23.6% Fibonacci retracement of the 2015 to 2016 rise. It can also be argued that there is a head and shoulders pattern forming. However if EUR/GBP makes and breaks 88 cents, it should be headed for 90 cents and Brexit is significant enough to drive the pair to that level.